With solar panel prices dropping below $5.50 / watt installed, many homeowners and businesses chose to go "green". Many are attracted not only by the prospect of reducing their carbon footprint, but also by the significant financial savings that solar electricity affords. Research conducted by the Appraisal Journal states that a solar electric system may increase your home's value by 20 dollars for every 1 dollar in annual utility bill savings. However, one crucial aspect that many people often ignore is the quality of the roof on which the PV system is installed. If your roof is in poor shape and you install solar panels, then it will need to be replaced in just a few short years, which requires removal of the PV panels. Therefore, it is smart to think long-term and replace the old roof when you install solar panels. 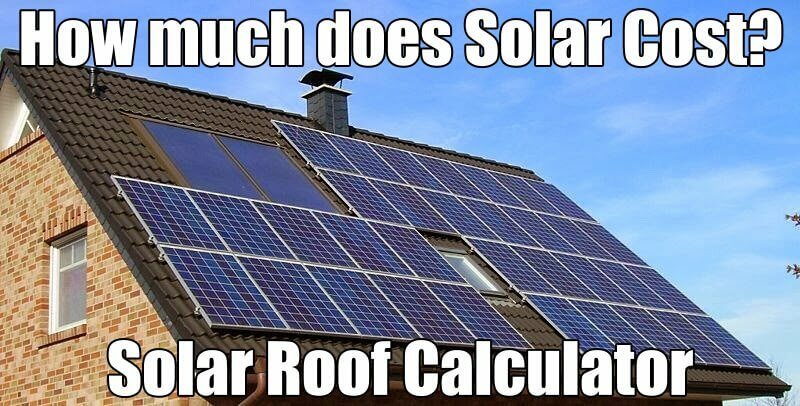 This calculator will help you estimate the cost of installing BOTH a new roof and a solar PV system at once. Note, if you consider to opt for a "free" PPA (Power Purchase Agreement) system, such as those offered by SolarCity and other similar vendors, this tool is NOT for you. The calculation only works if you buy the whole system yourself. 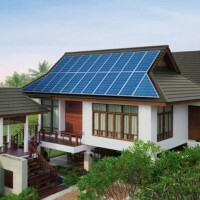 Get Free Solar from SolarCity - America's biggest solar integrator! The cost of solar systems is calculated "after" the 30% renewable energy tax credit (and optionally local / state rebates). Roof costs include: tear-off of existing shingles, installing a new system with Ice and Water shield + roofing felt. All prices assume that a licensed / insured contractor is doing the work and pulling all building permits. 1) The cost of Solar PV modules, mounding / racking hardware, roof flashing, electric wiring, inverter (either a single unit or micro-inverters), monitoring system, etc. Optionally, you can add an off-grid battery backup system. 3) Electrician's labor to connect all panels together, tie the system to the electric grid, as well as set up the utility company to count excess power produced during the summer months (this is when your meter is spinning back) and to give it back to you in the winter. Out of all the popular roofing materials, metal is best suited for solar panel installation. Solar modules have a life expectancy of about 20-25, so experts recommend that a roof surface on which they are installed should last at least as long. Metal is an ideal choice, lasting at least 50 years. On the contrary, roof shingles are a highly problematic option, as most products last 12-15 years or less. Another problem with mounting solar panels on asphalt shingles, is that most systems require penetrations through the roof surface, invariably leading to leaks down the roof. Moreover, creating these penetrations jeopardizes the integrity of the roof, effectively voiding the manufacture's and contractor's warranties. You will not have deal with any of the above issues if you install a standing seam roof. By the nature of their design, panels are connected at the seams, which are above the roof level. The solar system rack is mounted and fastened onto these raised seams, without the need for any penetrations. Thereby, there is no risk of leaks or any other roof damage. Moreover, unlike roof shingles, which attract and store heat from the sun, a metal roof surface is highly reflective. In fact, it is the only truly green sloped roofing option. It will help keep your home cool in the summer, which will add up to extra energy savings. The most economical Solar Roofing combination is to use a Standing Seam Metal Roof with either Crystalline or Thin Film Solar Panels - a practical and sustainable option for residential Solar PV installations. The solar metal roof calculator will help you estimate the cost of installing a Solar PV System on an EXISTING Standing Seam Metal Roof. Optionally, you can also estimate the price of installing a NEW metal roof on your house. Below the calculator, you can read about the benefits and different types (Thin Film & Crystalline Panels on S-5 clips) of solar metal roofing. For more details on the cost of metal roofs, check out our guide. Cool Article! Been trying to update myself in the use of this type of material. Not many people want them in my area, though. Probably because I’m in the snow belt, ha ha… But you never know…good article! I assume you mean State Tax Rebate but just to let you know that there is a “Star Tax Rebate” in New York but that has to do with school taxes. How does hot climate and roof longevity factor into re-roofing cost? You may need to replace the roof more often, but the price of one time replacement stays the same. Optionally, a metal roof cab be used, which is a lifetime product.